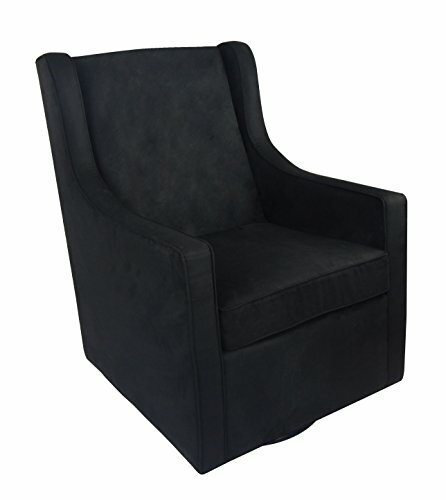 Timeless classic, the posh glider provides style and comfort to any room. The tall seat back measures 29" from the top of the seat cushion to the top of the seat back, making great for mom and Dad! the comfortable seat cushion measures 24" x 21" Width and 19.25" from the seat to the floor and is slip covered for easy care. The swivel and glide motion base provides complete comfort in movement. The hardwood frame construction ensures your enjoyment for years to come! the posh ottoman is perfect to round out your glider. You can prop your feet up and glide from head to toe for maximum comfort and relaxation! ottoman sold separately. The velvet and micro fiber polyester fabrics are easy to clean with mild soap and water. These items are proudly made in the USA! Tall firm Seat Back measures 29"